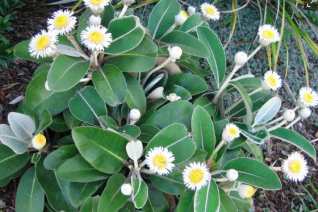 Marlborough Rock Daisy is a shrub that is a wonderful piece of architecture. This compact slow growing plant has large round leaves that are concave and steel gray on the upper surface and pure white underneath. In spring 6″ pure white stems elongate to pure white buds that open the most crisp white daisies you’ve ever seen. Each flower has a double set of white petals around a yellow center. Clean and wonderful plant that we find to be tender below 15ºF so it requires a very protected spot or makes a great, easy, long lived container subject. A beach plant in its native New Zealand it is excellently adapted to life on the milder coast. It is even somewhat tolerant of salt spray and will seldom be bothered by cold. Slow growing and dense to 3′ x 3′ in 6 years. Protect containerized plants form temperatures in the teens. Drought tolerant, low water requirements.